English Football League chief executive Shaun Harvey says he is "robustly" asking the government to allow safe standing in football grounds. In a letter to club bosses, Harvey said there was "significant popular demand" for standing to be allowed. Sports minister Tracey Crouch rejected a request from West Brom to trial safe standing at The Hawthorns. The safe-standing rule was introduced following the Taylor Report into the 1989 Hillsborough disaster. "I can assure you that we do not consider the comments made this week to be the last word on the matter," Harvey wrote. "We will continue to engage robustly with government and other relevant stakeholders in order to achieve the changes to the all-seater policy that our clubs seek." West Brom's pilot scheme would have meant 3,600 seats in the Smethwick End were converted to 'rail seats', which can be locked in an upright position. The Baggies - who are bottom of the Premier League - hoped to install them in time for next season. Crouch's decision has been heavily criticised by both fans and safety experts, with an online petition to force the government to debate the issue having already amassed more than 56,000 signatures. "The government should not underestimate how popular a change in approach would be with the football-supporting element of the electorate," Harvey added. Scottish Premiership leaders Celtic introduced safe standing in the summer of 2016. Manager Brendan Rodgers endorsed the move, saying it helped to create a "better ambience", but admitted "it may not be for every club". 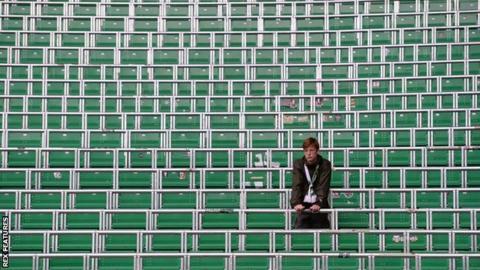 The All Party Parliamentary Group for Football is set to discuss safe standing on 1 May, while safety experts will meet on Thursday at the Sports Grounds Safety Authority's annual conference.